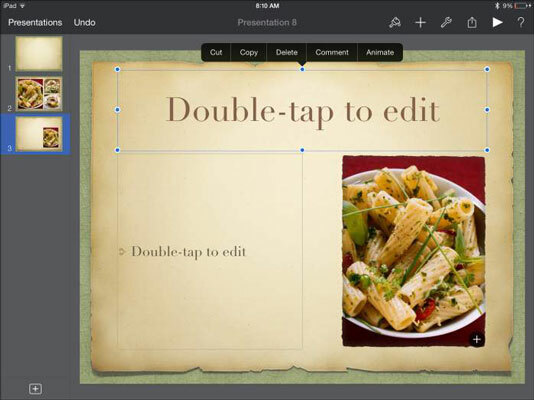 All three apps have been recently optimized for those iPad models with a brilliant Retina display, as well as receiving some new templates you can base your presentation on. Each program you download from the App Store on a new iOS 7 device is free. iCloud automatically migrates the apps and documents you create with these programs to any other Apple devices running iOS. Take a quick look at these three iWork for iOS apps, all of which have been upgraded with the release of iOS 7. For many people, word processing is the core of an office suite. In fact, many people don’t get beyond it. Pages for Mac adds a big desktop publishing plus to word processing in that it also allows you to create page layout documents. These have the type of structure you see in newspapers and magazines — articles don’t just flow one after the other. Instead, an article on Page 1 may be continued on Page 4, and another article on the first page may be continued on Page 8. Also, objects such as photos are often placed in specific positions on a page, and they don’t move as text is added or deleted. 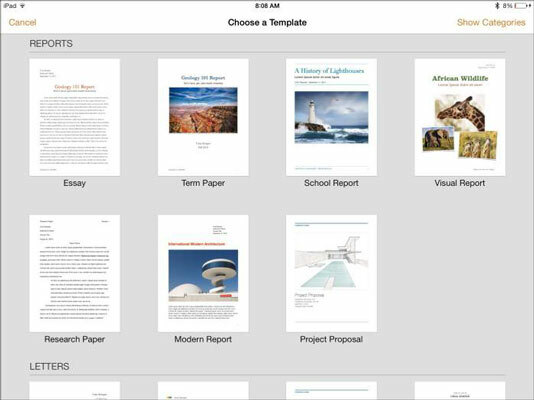 iWork provides you with a variety of sophisticated tools to create your Pages documents. These include advanced font handling, color, tables, and charts, as well as the ability to place QuickTime movies and hypertext links in your Pages documents. 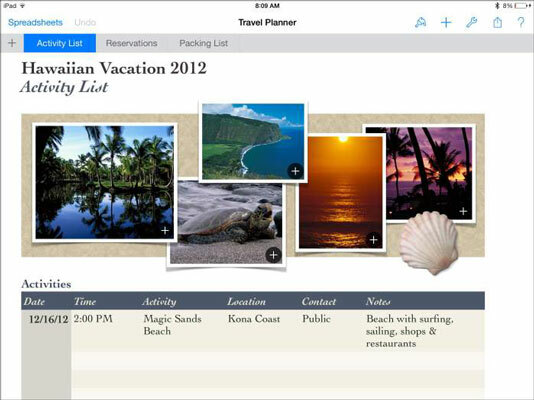 iWork applications also provide a variety of template options for your documents. This figure shows some of the templates available with Pages for iOS. Like all spreadsheet programs, Numbers enables you to enter data in rows and columns. One of the most useful features of spreadsheets is that they perform calculations by means of formulas. For example, if you have a column listing your grocery expenditures by week, the addition of another grocery bill will cause the program to recalculate the column’s total. Spreadsheets are about data (usually numbers) and fast calculation updates, but they can also help you organize data such as address lists and even generate charts to show data trends. Spreadsheets can go beyond the common grid interface, and Numbers excels at this approach. Take a look at the Numbers document shown in this figure, which is based on the Travel Planner template. A single document can have a number of sheets (like sheets in a Microsoft Excel workbook). On iPad, sheets appear as tabs, as shown in the figure. A Numbers sheet can contain a variety of objects such as tables and charts, but it can also contain other iWork objects, such as graphics, text boxes, movies, and audio. In the figure, the sheet is shown with a table and five pictures above it. Call them lectures, classes, sermons, or sales pitches, but presentations are all much the same: Someone stands in front of a large or small group of people and explains, teaches, entertains, or informs them. In some cases, a presentation can run on its own or be run by the viewer. Today, a presentation often includes multimedia elements: slides of buildings in an architecture class, slides with music in a presentation about your community theater’s latest musical production, and movies of good times on the beach in a talk about Uncle Charlie’s summer vacation.